We had a medical student from Taipei Medical University (6th grade) for 2 weeks from Feb 24th/ 2014. His name is Mr. Yen Chi-Feng. We had a great time with him. 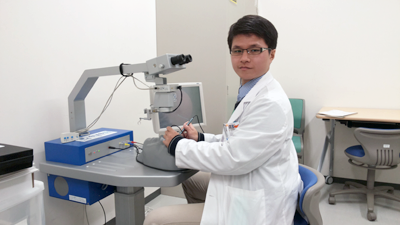 Here is his comment on his stay at our Ophthalmology department, Nagoya University School of Medicine. Copyright © Department of Ophthalmology Protective care for Sensory Disorders Nagoya University Graduate School of Medicine All Right Reserved.